Get Help from an Expert London Handyman! Do you need odd jobs done around the house? Our home maintenance experts can be dispatched to your home at short notice, ready to take care of property repairs, plumbing or electrical work, carpentry, tiling, flooring… and a whole host of other odd jobs! Call in our London handyman team, and prepare to experience our legendary service – fast, efficient and carefully designed to deliver the very highest standards of customer satisfaction. Enjoy the professional completion of all your household maintenance projects, by calling our highly trained and personable team of handymen. Years of training and experience mean that we’ve got the know-how and the skill to get any household job finished to perfection! From painting and decorating through to fixing a door handle, we provide home maintenance services with a friendly face. Our London handyman team is held to the highest standards of service… and we’ve had some great feedback from past customers, as you can see for yourself over on our reviews page. Discounts available on multiple service bookings - for example, you could combine emergency water damage restoration with a new flooring installation, and enjoy substantial savings. 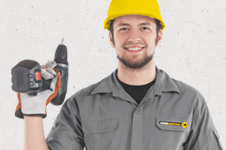 Book London Handyman Services Today! Give us a ring now, on 020 3746 0607. Our lines are open 24/7, and we have a team of knowledgeable staff on hand to answer any questions that you might have. You can also get a free quote for any of your maintenance needs, personalised, and completely obligation-free. With our flexible booking slots, we can work around your schedule to deliver first class London handyman services at a time that suits you. You can also request a quote right now, by using our online booking form. Alternatively, get an immediate response to your queries by using our online chat support feature. When it comes to home maintenance, plumbing, repairs, or any odd jobs that need doing around your home, our handyman team is more than up to the task!